One of the 'perks' of business travel is that you get to join a whole bunch of clubs that you can't track, with a whole bunch of cards you won't carry. Every once in a while, though, you get enough points to actually do something. We had a pile of points available to us for the Hyatt, so we decided to go to Jakarta for a weekend. Jakarta is a big, spread out, undefined mess of a city. It's dirty, noisy, crowded, and hot. 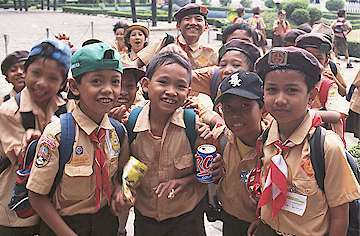 Fortunately, it's also full of friendly Javanese people. Most of the sights in Jakarta are monuments by the government, which have been given funny nicknames by the populace. Not exactly compelling tourist fodder. Still, we made an effort to find some attractions. 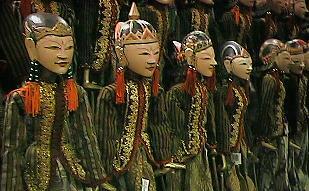 One day, we went to the Wayang Puppet Museum. It's extensive, but old and badly lit. We also went to the South Jakarta art shops. The traffic was terrible, so we didn't spend much time there. On another morning, we went to Taman Mini Indonesia. 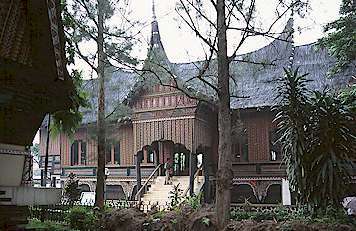 It's a park that recreates Indonesia through its' architecture and art. Surprisingly, it's not touristy. Most of the visitors are Javanese who will never make it to the other islands. We ate a typical Indonesian family picnic lunch with an employee of Japan Airlines and his family, waded like rock stars through a mass of schoolchildren who acted like they had never seen a white man, and jammed with some gamelan musicians. All-in-all, a great day. If you ever find yourself in Jakarta, you should go to Mini Indonesia. The highlight of the weekend, though, was a walk down some residential streets between the city center and the Hyatt. We stopped and talked with some local people and took a lot of pictures. The street venders were always waving and smiling for our cameras. One man sat us down on his patio and showed us old pictures. He had guided some Americans about 10 years ago. Apparently, he kept the photos by the front door, in case an American walked by. We looked at the photos and talked while the kids hammed it up for our cameras. The Javanese seem to love having their pictures taken. That's good for us, because their warm eyes and natural smiles make them very photogenic.